He was born in Schweidnitz in Silesia (now Swidnica in Poland) and was educated at the bass viol. Having been a law student in Frankfurt an der Oder where he also played a major role in local musical life, he joined the chapel of Frederick, then still Crown Prince of Prussia, in Ruppin, later Rheinsberg. It is here that he started a series of weekly concerts on Fridays, the Freitagsakademie. It is likely that his chamber music was written for performances during these concerts in which both professional and amateur players participated. When Frederick became King of Prussia and moved his court to Berlin, Janitsch continued his Friday academies there. Janitsch's contemporary Johann Wilhelm Hertel stated that he "was a fine contrapuntalist, and his quartets are still paragons of their kind." The programme opens with three such quartets, scored for oboe, two string instruments and bc. The Sonata da camera in F is for oboe, two violins and bc; the oboe can be replaced by a flute. The scoring suggests a sort of concerto da camera as we know from Vivaldi's oeuvre, but that is not the case. The oboe and the violins are treated on equal footing. There are some episodes in which one of the instruments gets involved in a dialogue with the two others, for instance oboe/violin I versus violin II or oboe versus the two violins. In the Sonata da camera in E flat the second violin is replaced by a viola. Interesting is the opening movement which has the indication andante con stilo di recitativo which includes recitativic and arioso episodes. The viola plays an even more prominent role in the Sonata da chiesa in F. It opens the first movement and continues to play a major role. In the second movement it is the cello which rises to prominence and is given some obbligato episodes. At such movements the basso continuo is omitted which lends this movement the character of a quartet, pointing in the direction of the classical string quartet. The Sonata da camera in D is scored for keyboard and viola. Johann Sebastian Bach was the first German composer who wrote music for keyboard and a melody instrument: the sonatas for harpsichord and violin. It became a popular genre in the mid-18th century. 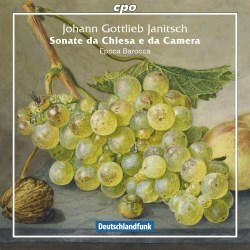 Some composers, such as CPE Bach and Johann Gottlieb Graun reworked trio sonatas to sonatas for keyboard and melody instrument. Another composer who was at the service of Frederick, Christoph Schaffrath, also composed quite a number of sonatas – called duettos – for keyboard and a melody instrument. Some of them were recorded by Epoca Barocca (CPO, 2009). As the viola was often used as an alternative to the viola da gamba it cannot be excluded that these viola parts may have been played on the viola da gamba. After all, Frederick had one of the last great virtuosos on that instrument in his chapel, Ludwig Christian Hesse. However, there is no evidence that these pieces have been played at the court; they could well have been intended in the first place for the concerts of the Freitagsakademie. The Sonata da chiesa in D minor and the Sonata da camera in G minor are both in the scoring of the traditional trio sonata but idiomatically they reflect the fashion of the time. Janitsch is a little-known composer, if one compares him with his colleages in Frederick's chapel. The neglect of his oeuvre which is not that large but substantial is unjustified. Only in recent years his output has been given more attention, for instance through a series of recordings by the Canadian ensemble Notturna (vol. 1, review; vol. 3, review). Because of that the present disc is most welcome. It offers an interesting programme, which is varied, despite the similarity of the scorings. In addition, Epoca Barocca, which has a liking for less common repertoire, as its discography shows, delivers very fine performances. There are only two issues here. In the Sonata da camera in D the harpsichord is a little underexposed which seems due to the miking; it should have had more presence. In the two sonate da chiesa Christoph Anselm Noll plays the organ. That is a legitimate option in earlier music, but I doubt whether an organ was used for the basso continuo at Frederick's court or at the concerts of the Freitagsakademie.